Cooking turkey in a bag is the preferred method for some folks. There are several benefits for this process like keeping the turkey from drying out because the moisture is trapped and held close to the turkey, giving a margin of error the cook for producing a juicy and flavorful turkey, and cooking time is shortened because the turkey can be cooked at higher temperatures. There’s no more need to turn the turkey over and you don’t have to baste it anymore. However, turkeys cooked in a bag are generally not presented at the table because the skin will not be the usual satisfying crispy brown. You can follow the recipe below if you want to try cooking your own juicy turkey in a bag. Choose your Bird first. Have it thawed then prepare it for bagging. Remove the bird from the wrapper and have the organs pulled out. Then rinse the entire bird and prepare the stuffing if you want to stuff the bird. If not, add seasonings for flavor. Preheat the oven until it reaches a temperature of 350 degrees. In a turkey sized oven bag, place about 1 tablespoon of flour then spread it around by shaking the bag. Put the whole bird into the bag and lay on a roasting pan. To let the steam out, you can slit small cuts on the bag then place the bagged turkey into the oven. But it would also work fine if you don’t make any cuts on the bag. It takes around 2½ to 3 hours to cook a 16-pound bird. Cook for one more hour if it is stuffed. Start cooking with the bird’s breast up, then with the breast down. Doing so will keep the moisture and juice when the bird is already cooked. There’s no need for basting because of the steam and with the help of the plastic bag. Test the temperature of the meat using a kitchen thermometer once you think that the bird is done. Test the breast first then the thigh. The temperature should be between 165 to 180 degrees. Check the temperature of the stuffing as well (if the bird is stuffed). 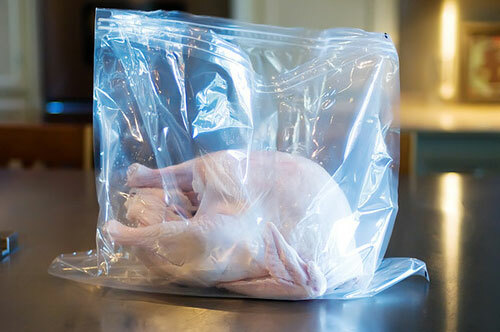 For the last 30 minutes of cooking, take out the bag if you want to present the turkey the traditional way. Note that the turkey may fall apart when cooked in a bag. Take the bird out of the oven then serve. No matter how the done the bird may appear, always check the internal temperature first. Make sure there is enough room inside the oven so that the bag does not get in contact with hot surfaces. How to Buy a Dress for a Party?